We will work with you to secure all the official paperwork for the matrimony. There are rules and procedures in Italy that are required prior to your arrival. Our staff will confirm your city hall dates and paperwork. Whether your wedding is a civil, religious, or symbolic one, we work with the Italian consulates and communal offices on your behalf. Civil ceremonies may be celebrated in the city hall of any Italian city, and civil ceremonies can be celebrated with religious rites in any church, synagogue or other location. 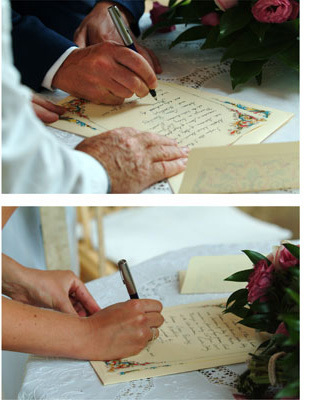 The matrimony is valid as long as the celebrant is recognized by the Italian state; and we will guarantee all the planning and paperwork for you. Foreigners wishing to marry under Catholic, Protestant, Orthodox, or Jewish rites may do so in a church, synagogue or any other location, before a celebrant who is officially recognized by the Italian state. Symbolic weddings may be celebrated in a chapel or location of your choice without limitations or restrictions. We will go through each step to secure all legal paperwork.